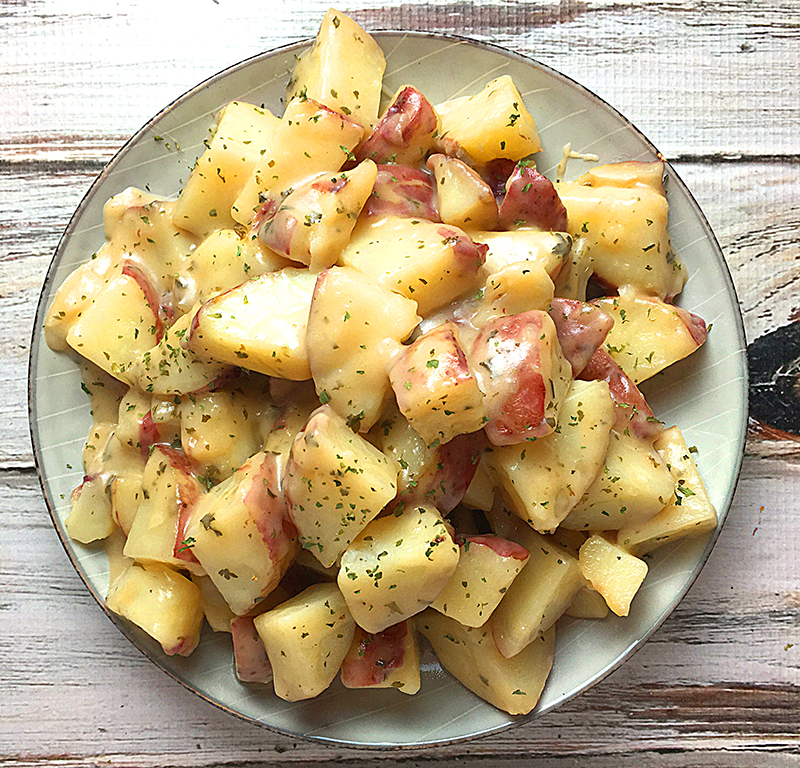 Your Instant Pot pressure cooker is perfect for making this quick and easy Instant Pot Parmesan Ranch potatoes recipe. 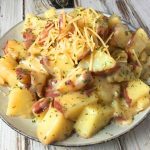 You only need a few simple ingredients and a handful of potatoes and you’re ready to make the tastiest, cheesiest potatoes that everyone will love. After a 7 minute pressure cook, you’ll do a quick pressure release and start mixing in the Parmesan cheese. You do NOT want to just dump all the cheese in at once. You press cancel to stop the keep warm function, then use the saute setting on low. Now add the cheese 1/4 cup at a time while continually stirring into the potatoes and water. Slowly, the water will and cheese will thicken and by the time you have all the cheese mixed in, it will be a creamy delight. After all the cheese is mixed in be sure to press cancel to stop the saute mode. 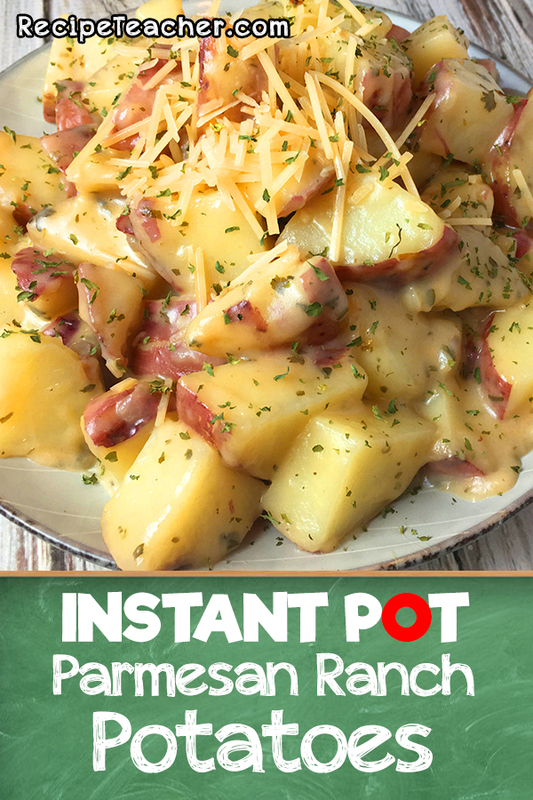 Then you’re ready to serve your delicious Instant Pot Parmesan Ranch potatoes. What if you use regular potatoes instead of red potatoes? Should cooking time increase? Can I just use more broth instead of the water? Or is there a reason for water and broth. Hi Leslie, you can certainly use all broth or all water. I found that by using just a 1/2 cup of broth with 1/2 cup of water gave it the perfect balance of flavors, but you can definitely use one or the other. 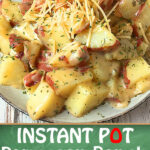 I am still learning with my Instant Pot and this looks easy to make! I have made a couple things in it and even created one recipe of my own. Major accomplishment for me since I felt overwhelmed by it when I first got it (it sat in the box until I felt confident enough to use it lol!) I love potatoes and I make something similar in foil pouches (but it takes about an hour in the oven.) I will definitely be trying this one very soon, thank you! Made this last night with dinner. My husband and I both really liked it. It was so quick and so easy, and that’s a big bonus for me because I can spend more time concentrating on the main dish. My husband doubted it would be done in only 7 minutes, but it was perfectly cooked and turned out great. Only change I made was to omit the salt since I am trying to eat a lower sodium diet as much as possible. Still had plenty of flavor and didn’t miss the salt at all. Will probably try experimenting using other veggies, too. Thank you for a great recipe. It’s a keeper! Is the Parmesan the type that is shown sprinkled on the potatoes, or the kind in the bag with the other cheeses? Hi Cindy, either would work but I use the grated kind that’s in the plastic round containers. Ive found that using fresh parmesan and grating it myself taste better. Do you put the patatoes directly in the instapot or on the trivet? That’s a great idea, LiLi. Would need to be cut thick to not get too mushy. Can you use a crockpot? I have a box of ranch dressing instead of the packet. How much would you use in place of the packet? I’d go with about 2 tablespoons. Would also be good with ham or sausage added. How can I fix this without an instant pot? Stovetop, oven, crockpot? Hi Pat. I would probably be easier to make in the oven than a crockpot. Do you think I could make,these, cook and then freeze? Trying to prep some meals for vacation next week, if not freeze, how ling do you think they could stay in a Ziploc bag in fridge? Made these in my motor home 4th of July weekend…they were a hit!!! Making them again tonight at home….good recipe, thanks a lot!! Yummy, I’m going to try more of your recipes. I cut the amount of potatoes in half, but added the same liquid, I thought it might be too much liquid so I took some out. Most recipes are for 4+. I didn’t take a photo, but I made these and they were a hit! I started with sautéed onions and garlic before adding the potatoes, broth and ranch dressing. When the potatoes finish cooking you may think it’s too watery, but when you stir in the Parmesan cheese, it becomes a creamy sauce (use fresh course grated from the deli, not the dry variety in a container). Be sure to add the cheese half at a time, then stir and add the rest. Note – don’t add any salt until tasting because the ranch dressing is salty. What is this “packet of ranch seasoning/salad mix” ? You can purchase 1oz packets of dry ranch dressing/seasoning mix at most grocery stores. These sound delicious! If I want to double the recipe do I need to double the liquid? Hi Stacey. If you’re going to double, or make more than the recipe calls for, you would indeed add more liquid, as well as the other ingredients. You might also have to add another minute or two to the cooking time. I’ve actually made them in batches when i’ve need a large amount. Check back and let me know how it goes. Loved these! Super easy and tasty, great for a weeknight dinner or party. Sounds great with the Buffalo sauce on top! I’ll have to give that a try. Very glad you enjoyed!